Popularized by chefs like Justin Wilson, and Paul Prudhomme, this blackened fish and green rice are a New Orleans staple. 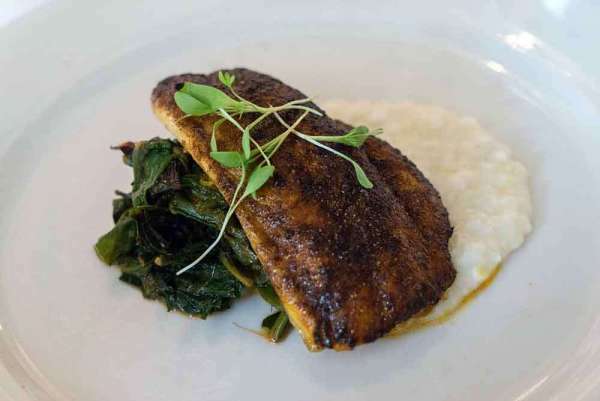 Caption: Here the blackened talapia is served with grits instead of rice. Image CC--Edsel Little. Celiac.com 04/06/2019 - If you’re looking to add a bit of snap to your next meal, look no further. This simple recipe covers fresh tilapia or other firm white fish in a blend of herbs and spices. Give it a quick sear on each side, and call it dinner. Crunchy and spicy on the outside, tender and juicy inside. It’s sure to honor its roots and leave your hungry eaters satisfied. Yum! Meanwhile, in a food processor, pulse the parsley, lemon zest, 2 tablespoons oil, and ¼ teaspoon each salt and pepper until finely chopped; set aside. In a small bowl, stir together the paprika, garlic powder, thyme, cayenne, ½ teaspoon salt, and ¼ teaspoon black pepper. Brush the lemon juice over the fish, then coat in the spice mixture. Heat the remaining tablespoon oil in a large skillet over medium heat. Cook the fish in two batches, adding extra oil if necessary, until the fish is beginning to blacken and is opaque throughout, 2 to 3 minutes per side. Fluff the rice with a fork and fold in the parsley mixture. Serve with the fish and lemon wedges. This recipe comes to us from Valerie Wells. 1 can (14 ½ oz.) gluten free chicken broth. Thread chicken, sausage & shrimp onto skewers. Melt butter with remaining ingredients. Place skewers on grill; brush with butter mixture. Grill until cooked through, about 5 minutes turning once. In pot melt butter over medium heat. Add red pepper, celery, onion and carrot; cook, stirring often, until softened, 3 minutes. Stir in rice, ketchup, garlic, thyme, salt. Add broth, one cup water & bay leaf. Simmer until liquid is absorbed. (White rice takes about 30 minutes. Brown rice takes about 45 minutes.) Serve w/ skewers. Roux: Place gluten free flour into cast iron skillet and cook over medium heat. Stir constantly, until flour is a dark brown. Season chicken on both sides. Put cooking oil on bottom of iron pot. Brown chicken on both sides at medium heat. Take chicken pieces out of pot when browned and set aside. Drain cooking oil from pot leaving very little to coat the bottom. Add onions and bell pepper to pot and cook until onions appear clear. Add chicken pieces back to the pot along with the sausage, roux, parsley, and water. Add the season salt and black pepper to taste. Cook for 1 hour. Okay, so fried foods aren't exactly a good model for the healthiest way to eat. I get that. However, being gluten-free has made me pretty much fried food-free, as well. So, when I discovered recently that crushed Rice Chex makes an amazing gluten-free coating for frying foods, the gloves came off. I've been breading and frying all of my old favorites. One of my old favorites is most certainly catfish prepared in the southern style. Now, I know two ways to make catfish, though there are doubtless many, many more. One way is dry, and the other is marinated. This marinated version is my favorite way to prepare catfish. In a large bowl, dissolve 1½ tablespoons of salt in 1 quart of water. Cut catfish fillets into 3 inch strips and add to salt water. Marinate for 30 minutes at room temperature, or in the refrigerator for one hour. Remove fish from salt water, and dry lightly on paper towel. Marinate fish fillets in a small bowl containing buttermilk, and a dash of salt and pepper. (About 30 minutes). In a large plastic bag, combine the cornmeal, crushed Rice Chex, ½ teaspoon salt, pepper, cayenne pepper, paprika, garlic powder, and thyme. Pull fish fillets from the buttermilk, a few fillets at a time, add to the cornmeal mix, and toss gently until fillets are evenly coated. Place coated fillets on a clean, dry plate. In a Dutch oven or fryer, heat oil to 350°F. Use a slotted spoon to gently lower several pieces at a time into hot oil. Fry until golden brown, about 5 minutes. Fish will float when done. Make sure the fish cooks evenly on the outside. You can turn fillets once if necessary to make sure the outsides are evenly brown. Remove from hot oil to drain on paper towels. Tip: For crispy fillets, make sure not to overcrowd the pan. Too many fillets at once will lower the oil temperature, which will make the breading absorb oil, and leave your fillets soggy. Celiac.com 04/19/2016 - Blackened Redfish is a Cajun classic that can also be prepared quite nicely with the much easier to find Tilapia. This recipe delivers a tasty, flavorful version of blackened fish that pairs well with slow cooked red beans and rice. It's easy to make at the end of a long day. Just cook the fish and rice, and serve up the beans. Cook the rice according to package directions. Meanwhile, in a food processor, pulse the parsley, lemon zest, 2 tablespoons oil, and 1/4 teaspoon each salt and pepper until finely chopped; set aside. In a small bowl, stir together the paprika, garlic powder, thyme, cayenne, ½ teaspoon salt, and ¼ teaspoon pepper. Brush the lemon juice over the fish, then coat in the spice mixture. Heat the remaining tablespoon oil in a large skillet over medium heat. Cook the fish in two batches, adding extra oil if necessary, until the fish is beginning to blacken and is opaque throughout, 2 to 3 minutes per side. Fluff the rice with a fork and fold in the parsley mixture. Serve with the fish and lemon wedges, if desired. 1 pound andouille sausage, sliced into rounds 1 large sweet onion, chopped 1 green bell pepper, chopped 1-2 tablespoon gluten-free red pepper sauce, to taste (optional) 8 cloves garlic, chopped 1 teaspoon ground black pepper 1 teaspoon Creole seasoning, or to taste 6 fresh basil leaves, chopped 1 ham hock 4 cups cooked rice Place the beans and water into a slow cooker. Brown the sausage in the skillet; remove from the skillet with a slotted spoon and transfer to the slow cooker. Reserve drippings. Add onion, green pepper, red pepper sauce and garlic to the drippings; cook and stir until tender, about 5 minutes. Transfer everything from the skillet to the slow cooker. Season the mixture with pepper and Creole seasoning. Add the fresh basil leaves and ham hock. Cover and cook on low for about 8 hours, until beans are tender. Cook until beans reach a creamy texture.